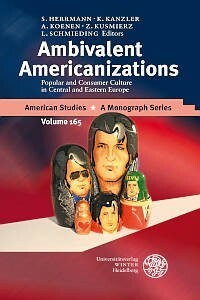 Edited by former and current Institute faculty members Prof. Anne Koenen, Dr. Katja Kanzler, Sebastian M. Herrmann, Zoe Kusmierz, and Leonard Schmieding, the book collects contributions from the 2005 conference Ambivalent Americanizations, including one paper by a then-student Thomas Kolitsch. Ambivalent Americanizations is 281 pages long, includes 22 images and an alphabetical index and is appearing in the DGfA's well-known series "American Studies – A Monograph Series" at the Universitätsverlag Winter. For more information on the book (and shopping opportunities), please refer to the Winter Verlag’s Ambivalent Americanizations page. Shortly, you will also be able to order the book directly through amazon.com. For more information on the conference, feel free to also refer to the 2005 conference homepage at www.ambivalent-americanizations.de. Why We Loved What They Told Us to Hate: Miscalculations of the Anti-American Propaganda in the Polish Posters of the Stalinist Period.